Hearing that the flowers on the West Coast were wonderful this year we decided to take advantage of the perfect weather on Friday to head of to Posberg. 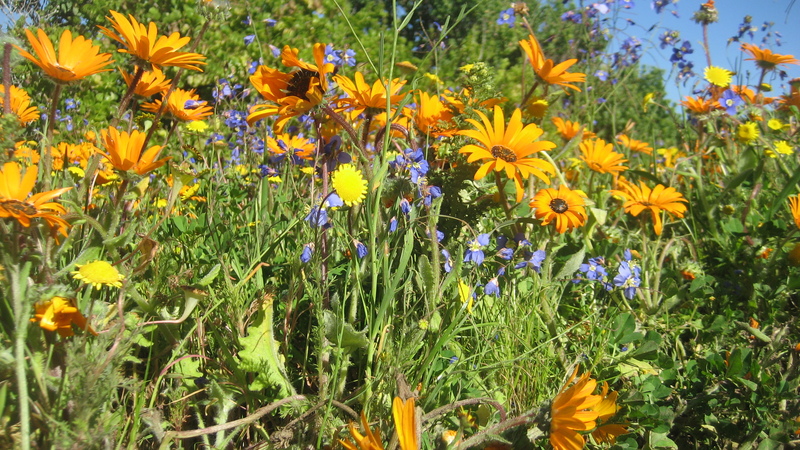 There have been good rains in the area this year, as well as further up in the Clanwilliam and Namaqualand, but this is the closest to Cape Town one can go to get the real wild flower experience. At this time of the year one needs to keep a good look out for snakes – we came pretty close to stepping on a puff adder and were lucky enough to be able to get a photograph before it slithered fairly slowly away. There are also masses of tortoises and if you look at the photographs you will see a sequence of a fight between two males, with the one tipping the other over on to his back and then biting his legs every time he tried to right himself. Needless to say, he was rescued by these interfering humans.